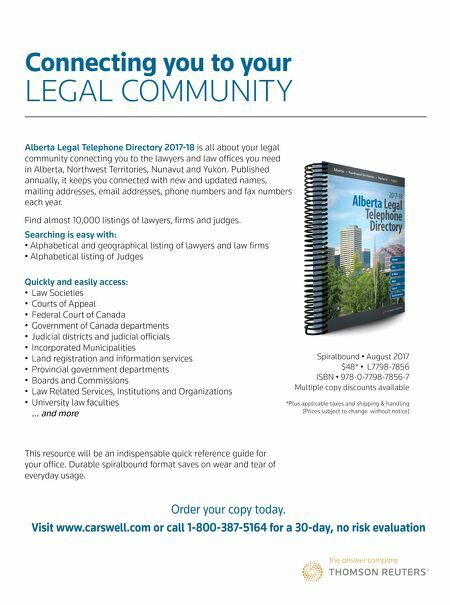 Connecting you to your LEGAL COMMUNITY Alberta Legal Telephone Directory 2017-18 is all about your legal community connecting you to the lawyers and law offices you need in Alberta, Northwest Territories, Nunavut and Yukon. Published annually, it keeps you connected with new and updated names, mailing addresses, email addresses, phone numbers and fax numbers each year. Find almost 10,000 listings of lawyers, firms and judges. Searching is easy with: • Alphabetical and geographical listing of lawyers and law firms • Alphabetical listing of Judges Quickly and easily access: • Law Societies • Courts of Appeal • Federal Court of Canada • Government of Canada departments • Judicial districts and judicial officials • Incorporated Municipalities • Land registration and information services • Provincial government departments • Boards and Commissions • Law Related Services, Institutions and Organizations • University law faculties ... and more Spiralbound • August 2017 $48* • L7798-7856 ISBN • 978-0-7798-7856-7 Multiple copy discounts available *Plus applicable taxes and shipping & handling (Prices subject to change without notice) Order your copy today. Visit www.carswell.com or call 1-800-387-5164 for a 30-day, no risk evaluation This resource will be an indispensable quick reference guide for your office. Durable spiralbound format saves on wear and tear of everyday usage.